A little rain and a little wind couldn't put a damper on the fun as Louisville downtown merchants sponsored Trick or Treat for local kids on Halloween. A good crowd of kids, parents and grandparents came out to join in the fun. It's late Friday afternoon and Andy, Barney, Opie and Gomer are down at the Courthouse making plans for the Harvest Fest in Louisville on Saturday. "Now Barney, I'm going to take Earnest T down behind the Post Office at 7 am and git him signed up for the 5K run. I know he's a little mean but he's real healthy and I think he could win that thing... and he promised not to throw any rocks during the race. While I'm doin that, you and Gomer get South Columbus Ave. all set up for the festivities. Now don't be arrestin nobody for vagrancy or let Gomer go around shoutin "Citizens Arrest, Citizens Arrest!" The Board Minutes from the Winston County Board of Supervisors meeting held on October 21, 2013 are now available for view. 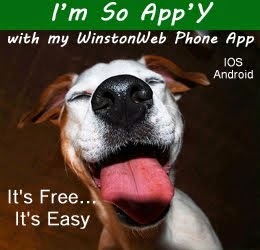 The minutes can be accessed online on the County's website at http://www.winstonms.com or directly by clicking here. Board minutes are not official until approved by the Winston County Board of Supervisors. The CAPPS after-school program is in full swing across the district. Students from across the district who attend the program receive homework assistance and have opportunities to participate in enrichment activities including art, PE, and science. The CAPPS program is a free program and is open to students in grades 5-12 and who live within the Louisville Municipal School District. CAPPS operates Monday through Thursday from 3:00-5:15 p.m. CAPPS has sites at Louisville Elementary School for 5th Graders, Eiland Middle School for 6th-12th graders, and Nanih Waiya and Noxapater Attendance Centers for grades 5-12. For more information about the CAPPS after-school program, contact the CAPPS office at 662-773-2035. LFD responded to a fire at 206 East Main on Monday night around 7:15 pm. The residence was engulfed in flames by the time firefighters arrived at the scene. An individual was at home at the time of the fire but escaped with no injuries. 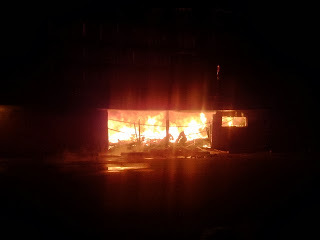 The amount of damage and the cause of the fire are not determined at this time and are under investigation. orders at Little Caesars for their favorite variety of pizza. 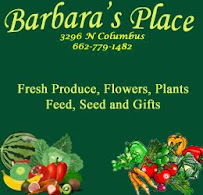 Owners John and Rachel Brownlee plan to hire as many as 48 part-time employees for the takeout pizza franchise located in the shopping center on W. Main (near Walmart). Downtown Merchants will hold Trick or Treat on Main Street on Halloween (Thursday) from 4:0o pm til 5:00 pm. Participating merchants only. "First Methodist Church will have Trunk or Treat at 6:00pm on Wednesday and church youth will be selling hamburgers and hot dogs." "Evergreen Baptist Church will be "Trunk or Treating" on Oct. 31st starting at 5:30 P.M. til 7:00 pm. Event will be inside the Family Life Center in case of rainy weather. "Good Hope Baptist in Nanih Waiya will have Trunk or Treat on Wednesday from 6:00-7:30. "First Baptist Church is having Trunk or Treat Wednesday 10/30 from 5-7. There will be inflatables (free) and face painting also. The Louisville Fire Department was called to the scene of a residence fire in the 200 block of East Main in Louisville around 7:15 pm this evening (Monday, Oct 28). Multiple units responded. Open blaze could be seen coming from the back of the home as the downtown area of Louisville filled with smoke. We will have more details tomorrow. Winston County Chancery Clerk Julie Cunningham is in the process of sending out courtesy notices for 2012 Delinquent taxes. Please be aware that you cannot pay your 2013 taxes until prior taxes are paid. The 2013 tax bills will be sent out by Winston County Tax Assessor’s office later this year. The interest and fees on Delinquent taxes continue to increase monthly. Please call the Chancery Clerk’s office at 662-773-3631 for Delinquent tax amounts or if you need further information. WinstonWebNews is in the process of moving our office over the weekend and into next week. As a result, news postings will be limited for the next few days. 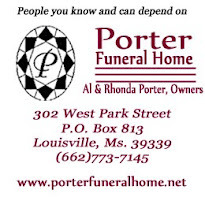 We will however keep you current on obituaries and upcoming events. We hope this move will help us to better serve the Winston County community and continue the growth that we have experienced over the last two years. We will have more details on our new offices and updated services in the near future. Thanks for following and supporting WWN. 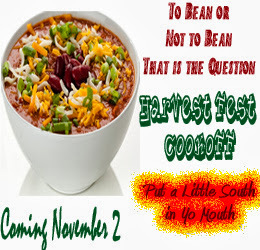 It is time for the Annual Harvest Cook-Off in Louisville, Mississippi.The "South In Your Mouth"
Harvest Cook-Off will be Saturday, November 2, 2013 on South Columbus Ave. This year’s Cook-Off will be Chili. You are encouraged to enter your best chili for a chance to win up to $1500.00. You can win in the Judges' Choice and the People’s Choice. Organizers have also added art and craft vendors this year and booth space can be purchased for only $35. To join the Cook-Off or set up a booth, call the Winston County Chamber of Commerce at 662-773-3921. For more information, click here. A salute to military veterans and recognition of sophomore football players highlighted the season finale for East Central Community College’s Warriors who were once again victims of a national power. 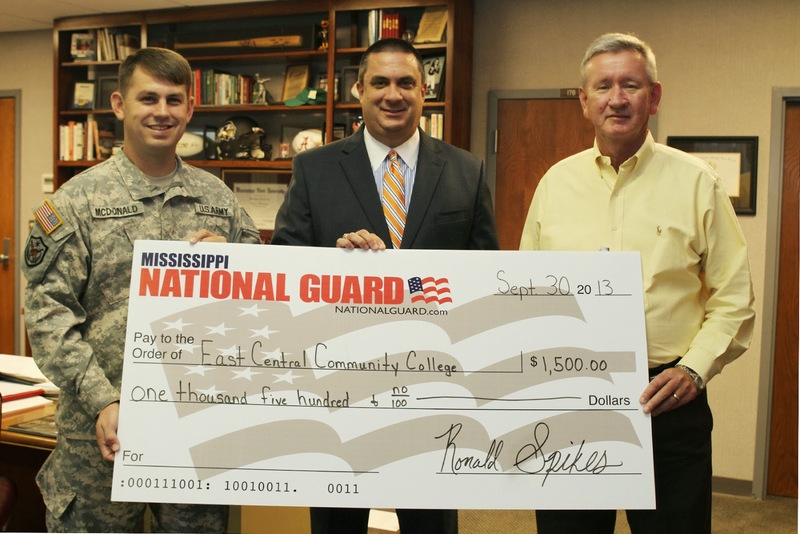 Mississippi Gulf Coast Community College proved worthy of its No. 5 ranking as the Bulldogs cruised to a 42-0 halftime advantage and completed the onslaught with a 49-7 MACJC South Division victory Thursday, Oct. 24 at Bailey Stadium in Decatur. Madelyn Ball is the winner of the South In Your Mouth Art Contest for the Harvest Cook Off and will receive $100.00 for her great piece of art. The Chamber of Commerce would like to thank Madelyn and the other participants for their help with this event. 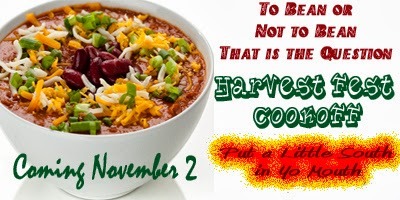 The Harvest Cook Off is scheduled for November 2nd in downtown Louisville. Just published on the Cybergrass Website, Native sons Carl Jackson and Jimmy Metts along with Dak Alley won the the International Bluegrass Music Association's 2013 Award for Best Graphic Design for the project "Grace Notes". To read the article -click here. Carl Jackson's Annual "Home for Christmas" Concert is scheduled for December 14th. Tickets are available at the Winston County Chamber of Commerce and is near a sellout. Six AM came early for many volunteers of the Friends of Nanih Waiya Community Park to get ready for the First Annual Nanih Waiya Fall Festival and Swamptown 5K. It was also somewhat gloomy with rain in the area and the intermittent sprinkles of rain at the festival site. But as daylight broke the darkness, it also broke the rain and a beautiful day was enjoyed by the many volunteers and festival attendees.“We were very nervous about the weather and the attendance for our event since it was our first and we only started on this 6 weeks ago.” said Friends President Jerry Hemphill. “But the rain went away and the people came!” added Hemphill. On May 12, 2013, approximately 400 people were participating in the Mother's Day Second Line Brass Band Parade when gunmen opened fire and wounded 19 people which included two 10 year olds. Immediately on hand were firemen who helped to save the lives of some of those that were wounded. Terrence Pichon, Jr. was one of the first respondents from Unit Engine 27 to arrive on the scene of the shooting in the 7th Ward neighborhood near the French Quarter. Several victims were seriously wounded but most were grazed and in good condition. The firemen provided first aide to the wounded and calmed the neighborhood during this tragic time. The Louisville Municipal School Family Center located on Ivy Avenue will be presenting a workshop on "Fire Safety" on Thursday, October 24th. Mr Randall Livingston will discuss and demonstrate good tips for fire safety at home. The workshop will be from 5:00 pm til 6:00 pm. For more information, please call 662-773-4018. You are cordially invited to the “Volunteer Recruitment Tea” hosted by the Winston Medical Center Auxiliary. The WMC Auxiliary provides vital services to the hospital’s patients and staff. By becoming a member of the Auxiliary, individuals find a wonderful opportunity to meet others in the community who share a similar interest in community service. As a member, you will form new friendships while making a difference in the community, the health of its citizens, and enrichment of the hospital that services them. The event is open to the public and anyone interested in volunteering is welcomed to attend! For more information call 779-5111. After their weekend series win, the Nanih Waiya Lady Warriors will host Stringer on Tuesday, October 22 at 4:00 pm. The best of three game series will be for the South State Championship Title before moving on to the State Title Series next weekend. The Lady Warriors defeated Bogue Chitto 2 out of three over the weekend. the Natron Wood Products facility began last week, (Oct 14). Providing an upgrade to the electrical resources at the facility once occupied by Georgia Pacific is a major step toward full operation. The approved contract work is expected to be completed in 90 days. Winston Medical Center provides not only long term care but also short term care that allows the patient to return home when possible.. read more here. 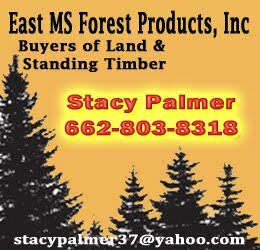 BROOKHAVEN – When Hurricane Katrina destroyed his timber stand in 2005, Lincoln County landowner Jason McDonald searched for an alternative crop. 4 for 4 tonight.. first time this year. Noxapater rolled from the beginning as did Winston. Good win for the Patriots. 3 blocked punts, 9 QB sacks, great kicking and timely offense keeps the Wildcats undefeated. Nanih Waiya fought a tough one before pulling away in the 2nd half..Thought for the night - "When the rest of us get through with this ol world, I bet the meek won't even want it." East Ms. Chapter of NWTF Bash a "Wild Success"
You will need to bring a jacket tonight for our local high school football games. Temperatures could drop into the upper 40's before games are over. The undefeated Louisville Wildcats will host Aberdeen tonight and Noxapater will play host to Ethel. Nanih Waiya is on the road and headed to Sebastopol while Winston Academy travels to Manchester. All game times are 7 pm and even if you're at your game, follow all the other county teams on your phone with WinstonWebNews. We keep you posted through Twitter, Facebook and our own Twitter feed page on our website.. Good luck to all our schools! Check out the banners on Ivy Avenue approaching Louisville High School. These went up this week. LMSD engaged with the City of Louisville to get these put up before tonight's home game. 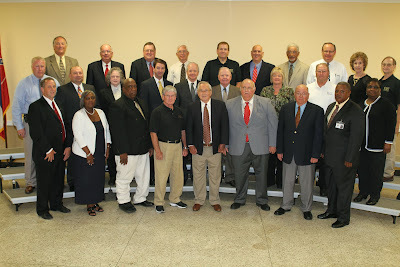 Serving on the East Central Community College Board of Trustees in 2013 are (first row, from left) Ricky Goldman, Philadelphia; Beverly Hart, Union; Delane Hudson, Louisville; Van Lucas and Rodney Bounds, both of Newton; Vernon Crotwell, Morton; William E. Kitchings, Carthage; and Jerry Smith (vice chairman), Philadelphia; (second row, from left) Ken McMullan of Louisville, Louisville Municipal School District Superintendent; Dr. Danny Lanier, Little Rock; Rebecca Farris, Morton; Dr. Jimmy Hollingsworth (chairman), Lake; Royce Shaw (secretary), Forest; Prentice Copeland, Philadelphia; Janie Wilbanks, Carthage; Randal Livingston, Louisville; and Annie Stowers, Forest; and (back row, from left) David Byars, Philadelphia; Tommy Dearing of Philadelphia, Neshoba County Superintendent of Education; Pat Cleveland, Conehatta; Leo Parker, Noxapater; Patrick Posey of Carthage, Leake County Superintendent of Education; Alan D. Rhea, Carthage; W. B. Jones, Walnut Grove; Bingham Moncrief of Morton, Scott County Superintendent of Education; and Patsy Clark, Louisville. Board members not pictured include Dr. Kimsey Cooper, Carthage; Edsel Cliburn, Union; J.O. Amis of Decatur, Newton County Superintendent of Education; and Jerry Nance, Louisville. Located in Decatur, ECCC serves Leake, Neshoba, Newton, Scott and Winston counties. A group of 45-50 gathered on Tuesday evening (October 15) at Lake Tiak O'Khata to participate in the Winston Medical Center Health Care Planning Initiative. WMC Chief Executive Officer, Lee McCall welcomed the crowd and explained that the public forum was vital to the successful completion of a community assessment needs report that is now a requirement under the Affordable Care Act. Louisville has a new fire chief. In Tuesday night's Board of Aldermen meeting, local officials unanimously approved the recommended candidate, Johnnie Roy Haynes. A local resident, Haynes served as assistant fire chief with the City of Louisville from 2001 through 2009 and has had 31 years of service with the city. Haynes should take over the position at the beginning of November and will replace Terry Johnson who resigned as chief on August 27. 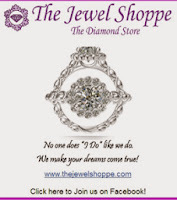 This is not a paid advertisement for Taylor or its products but we thought this was a great promotion for a local company and thought folks in our area should see it! JACKSON, MISSISSIPPI (October 15, 2013)-Public Service Commissioner Brandon Presley today won a 2-1 vote on the PSC to fight the Environmental Protection Agency's newest round of federal regulations aimed at the American coal industry and traditional coal power generation. The Friends of Nanih Waiya Community Park would like to welcome everyone to attend their First Annual Nanih Waiya Fall Festival on Saturday, October 19 on Middleton Road in the Nanih Waiya Community. The Festival will kick off bright and early with the inaugural Swamptown 5K Run/Walk. Check in for the 5K will begin at 7 am and the race will start at 8 am. The pre-registration deadline has passed, however, race day entries will be accepted for a $35 fee. Pre-registered racers will receive shirts and a limited number of extra shirts were ordered for on site entries. "Gun Bash" and catered banquet on Thursday, October 17 at 6:00 pm at the Grace Christian School Gym. Participants have a great opportunity to win prizes including guns, yeti coolers, generators, games, wildlife art and much, much more. One gun door prize for every 10 people with tickets. 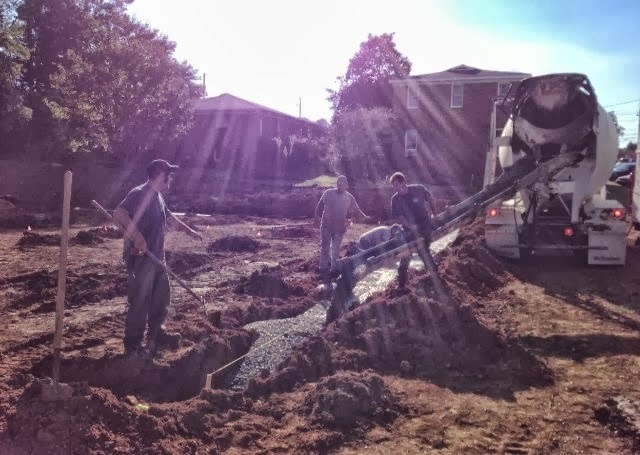 The event is catered by well known Taylor Grocery out of Oxford, Ms.
Church members, clergy and local officials gathered together on Monday, October 14, 2014 to begin a new chapter for the congregation of the Wesley United Methodist Church in Louisville. Groundbreaking ceremonies were conducted for a new church building to replace the existing structure. 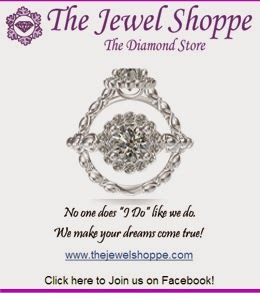 - See the Neshoba Democrat Article here on the Philadelphia Walmart. Reports of Issues in Starkville and Louisville as well. Allied Locke Industries is recruiting new employees for their Union site through a job fair that is being held at the Senior Citizen Center located in Northside Park at 100 Burt Drive in Philadelphia. The job fair is made possible through a collaborative effort and joint partnership between Allied Locke Industries, Taylor Machine Works, Richardson Molding, the MDES WIN Job Centers, the Neshoba County Community Development Partnership, and the ECCC Workforce Development Center. 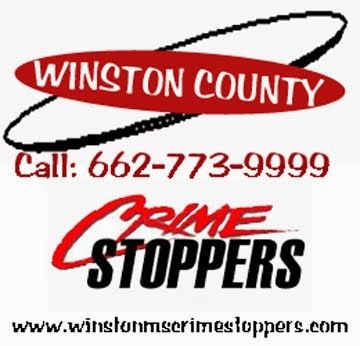 The Winston County Sheriff's Office is asking for the public's assistance in identifying and capturing the individual or individuals responsible for a stolen vehicle from the Shiloh community in Winston County. 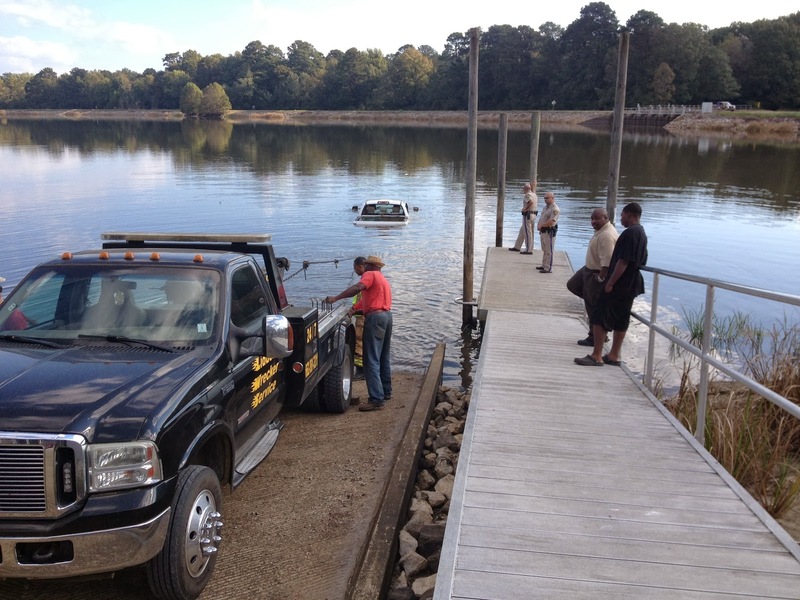 The white extended cab 2012 Toyota Tacoma was found submerged in Doyle Lake around 7 am on Saturday October 12, 2013. Anyone with information concerning this crime please contact Winston County Crime Stoppers at 773-9999 or the Winston County Sheriff's Dept. at 773-5881. Approved a final amended budget to close out the financials on the 2012-2013 school year. Approved the District's participation in the "dashboard to Diploma" program. 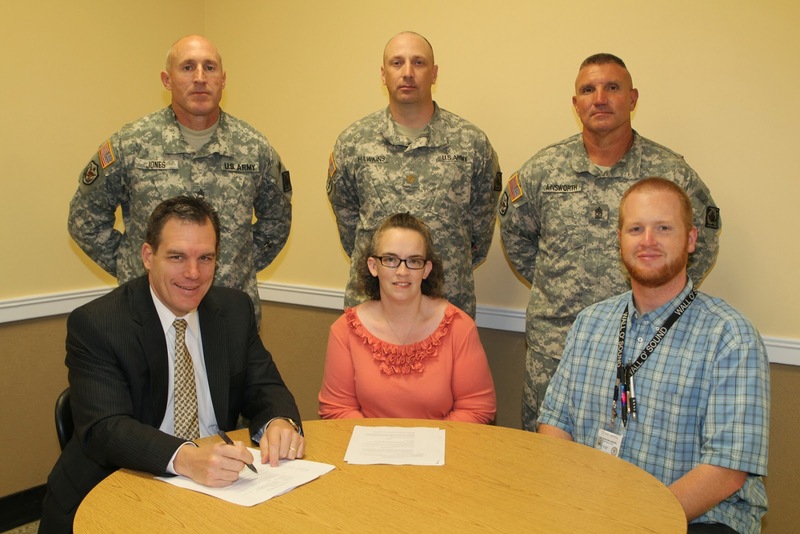 The District is one of six in the state to participate in this dropout prevention program. Higginbotham's petition was declined by the Ms. Supreme Court. Murder Conviction Stands - See WCBI link here J.C. Higginbotham is serving a life sentence w/o parole for the 2007 murder of L. S. Vowell in Winston County. The unapproved Board Minutes from the Winston County Supervisors' Meeting on Monday, October 7 are now online on the County's website. Supervisors dealt with a multitude of issues including a bid opening for a bridge replacement project on Old Robinson Road. After review a bid from J.J. Ferguson was accepted. The Board also approved numerous Homestead re-instatements, established joint checking accounts for area volunteer fire departments, and approved some hirings and pay raises for part-time Sheriff Department personnel. I am sorry to inform you that the Refuge Celebration for this Saturday Oct 12 has been cancelled due to the government shutdown. The Friends of Noxubee Refuge always look forward to helping with this event and are sorry we will not be able to help the Staff at the Refuge this year. The Winston County Library will be hosting a book signing for Warren Trest on Monday, October 28th, 2013 from 3:00pm-5:30pm. Mr. Trest is a Winston County native. He joined the Air Force and became the official Air Force Historian and has written some wonderful books, which can be found at the library. He is bringing Lt. General “Chick” Cleveland with him to the book signing – Lt. Gen. Cleveland is the subject of his newest book Once A Fighter Pilot. The Winston County Library will host 3 free seminars on the Affordable Care Act (ACA) over the next three months. A representative from Health Help Mississippi’s Starkville office will present information on ACA and answer any questions participants may have. Health Help Mississippi, which has locations in Jackson, Hattiesburg, Starkville, Hernando and Greenville, advocates on consumers’ behalf, educating them on their different options for health care, and assisting them in seeing if they could be eligible for any current government programs, such as Medicaid and the Affordable Care Act insurance program. Allied Locke Industries is recruiting new employees for their Union site through a job fair that is being held at the Senior Citizen Center located in Northside Park at 100 Burt Drive in Philadelphia. The job fair is made possible through a collaborative effort and joint partnership between Allied Locke Industries, WIN Job Centers, the Neshoba County Community Development Partnership, and the ECCC Workforce Development Center. The Job Fair will be held on Thursday, October 17, from 2:00 p.m. to 7:00 p.m. Anyone with training/education and/or work experience (two years preferred) in the following fields, are encouraged to apply: CNC, Welding, Lathe, and Milling machines. To be eligible to participate in the in the job fair, applicants MUST bring a resume that includes education and past work history with references and telephone numbers. For additional information, contact Heather Shelton, Office Manager and Engineering Technician, Phone 800-435-7752; Email,hshelton@alliedlocke.com; or go to www.alliedlocke.com. A fireworks show, performances by area bands, and presentation of the 2013 homecoming court are just some of the activities planned for East Central Community College’s Homecoming Pep Rally scheduledThursday, Oct. 10 at Bailey Stadium on the Decatur campus. The threat of rain, MSU vs LSU and various other activities kept the crowd and vendors away for the 6th Annual HarvestFest at Dean Park on Saturday, October 5, 2013. However, those that came and stayed were well entertained and well informed by Clown/President of Friends of Dean Park, Inc. Elder Richard Moncrief, Rev. Lorain Guyse of Door of Hope Food Ministry with an inspirational message, President of NAACP, Charles Hampton, Chairperson of the Coalition for Healthy Living Janice Hopkins and DJ Jump aka Harvey Hampton. Several activities are being held this week on the Decatur campus of East Central Community College in observance of Breast Cancer Awareness Month. Sponsored by Phi Beta Lambda, “Think Pink Week” gets under way Monday, Oct. 7, with the distribution of pink ribbons from 10 a.m. to noon on the East Mall, near Mabry Memorial Cafeteria. Staff members and students are encouraged to wear pink on “Power of Pink Day” scheduled Tuesday, Oct. 8. A group photo of those wearing “pink” will be taken at 2:15 p.m. in the McGee Gold Room in Mabry Memorial Cafeteria. “Bright Pink Day” is set for Wednesday, Oct. 9. Survey forms will be available from 10 a.m. to 4 p.m. in the Tucker Applied Technology Center to determine one’s risk for breast cancer. Additional information about breast cancer will be available Thursday, Oct. 10, as Association of Student Nurses representatives plan to distribute pamphlets regarding the disease and provide instruction on self-breast exams. The week’s activities conclude with a “Pink Balloon Release” scheduled at 11 a.m. Friday, Oct. 11, in the East Mall area. Balloons are available for $1 each in memory or in honor of those who have fought or continue to fight breast cancer. Donations must be received by Wednesday, Oct. 9 for the balloon release. For more information, contact PBL adviser Christy Ferguson, 601-635-6292 or e-mail cferguson@eccc.edu. Winston County CircuitClerk Kim Ming announced that no election would be required this November for the position of Louisville Municipal School District Board Trustee in District One. Friday, October 4 was the last day to qualify for the position. Ming indicated that since only one candidate qualified by the deadline date, election commissioners could certify that candidate to the Secretary of State's Office. 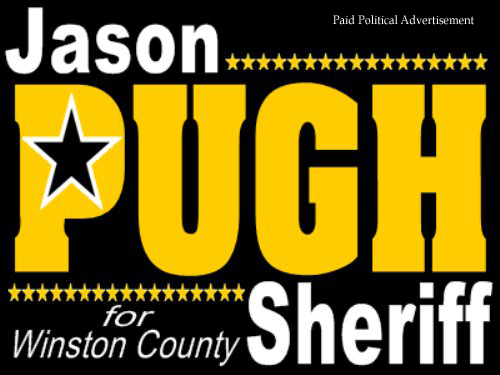 Winston County Sheriff's Office is asking for information leading to the recovery of an ATV vehicle stolen from a residence in the 3000 area of Hwy 397. The ATV was stolen sometime between 9:00 am and 5:00 pm on Friday, October 7. The vehicle is a 2011 Stealth ATV with a winch on the front. It is black and camouflage in color. MISSISSIPPI STATE -- While hunters may see Mississippi’s 1.75 million white-tailed deer as potential antlers on their walls, many farmers see reduced crop yields instead. Bronson Strickland, associate Extension professor in the Mississippi State University Department of Wildlife, Fisheries and Aquaculture, said the impact of Mississippi’s deer population varies depending on who is asked. Three of the county's four high school teams will be in action tonight. Nanih Waiya will hold Homecoming events as they take on Ethel. Louisville will play host to Winona and Winston Academy will travel down the road to Leake. Noxapater has the week off as they prepare for a big game against Pelahatchie next week. All game times are 7:00 pm and unless conditions change throughout the day, no major rain conditions are expected. 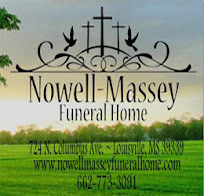 Louisville 35 Winona 0 **** Leake 21 Winston Academy 0 **** Nanih Waiya 40 Ethel 12 ****Games end early tonight as the County takes two out of three - As for the Wildcats we'll just say "Roberts to Goss...Roberts to Goss...Roberts to Goss.. oh yeah.. Roberts to Hudson and the Cats play pretty good defense too- (haven't been scored on in last two games". Great homecoming win for the Warriors of Nanih Waiya ..... and the guys play tough but wins are hard to come by this year for Winston Academy. We'll leave you tonight with this: Some folks say getting married is like sitting in a tub of hot water... after a while, it's not so hot... I wouldn't say that. Be home shortly, dear. The Winston Medical Center is actively seeking members of the public to participate in a community forum on local health care. The forum is scheduled for Tuesday, October 15th at Lake Tiak O'Khata at 5:30 pm. In a recent meeting with the Louisville Board of Aldermen, WMC administrator Lee McCall indicated that WMC was looking for public input on the most pressing health care needs of Winston County. After the forum, a selected focus group will meet to discuss the public comments and ideas and work with WMC to develop a three year plan for implementing changes and improvement to local health care issues. McCall said that WMC had a strategic plan and wanted the public's input. A big crowd was waiting this morning for the doors to open at the Friends of the Library Book Sale. The sale continues at the Winston County Library til 6 pm today, on Friday from 9-6 and on Saturday from 9 til noon. Great bargains.. The Board also heard from Airport Board President Mike Forster on progress at the facility as well inform the City of the resignation of Airport Engineer Dale Coward. Forster indicated that the needs of the Airport for long term planning and engineering services would require that the Airport request bids or proposals to fill the vacated position. Oct. 1, 2013 News Release: Services are pending for East Central Community College student Brittany Hutchinson of Forest, who was killed in automobile accident on her way to classes Monday, Sept. 30, 2013. WMC Noxapater Clinic Construction Well Underway!! Winston Medical Center Clinic-Noxapater is well under its way to soon open it's doors to serve patients! Pictured below are a few photos taken last week as construction and set up of the new clinic has begun. WMC plans to open its doors the first of November. The geeks, clowns and comis book and movie characters descended on Louisville on Saturday as the Coliseum hosted the 2nd annual Backwood Comic Festival. Vendors and folks just having fun filled the arena throughout the day. From Star Wars to Inky the Clown, there was something for everyone.